Gabriele Kühl and Wilson Lourenco recently described a new genus and species of fossil scorpion from the Early–Middle Eocene of Pesciara in Italy. The new taxa belongs to the family Euscorpiidae, and this is the first fossil/extinct taxa belonging to this extant family. Fossil scorpions are among the oldest terrestrial arthropods known from the fossil record. They have a worldwide distribution and a rich fossil record, especially for the Paleozoic. Fossil scorpions from Mesozoic and Cenozoic deposits are usually rare (except in amber-deposits). Here, we describe the only fossil scorpion from the Early to Middle Eocene Pesciara Lagersta¨tte in Italy. Eoeuscorpius ceratoi gen. et sp. nov. is probably a genus and species within the family Euscorpiidae. 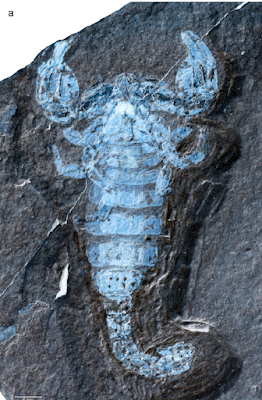 This may be the first fossil record of the Euscorpiidae, which are so far only known from four extant genera. Eoeuscorpius ceratoi gen. et sp. nov. was found in the ‘‘Lower Part’’ of the Pesciara Limestone, which is actually dated Late Ypresian stage (between 49.5 and 49.7 Ma). Besides a possible pseudoscorpion, the here-described fossil scorpion is the second arachnid species known from the Bolca Locality.